Squamous cell carcinoma (SCC) is the second most common skin carcinoma after basal cell carcinoma. For the vast majority of patients, squamous cell carcinoma is relatively innocuous. It is a small lesion that is easily detectable, grows within the skin, and is easily treated with surgery or other modalities available. The unique aspect of skin squamous cell carcinoma is the rare instances the skin cancer can be highly malignant and life-threatening. The origin of most squamous cell carcinoma of the skin is chronically sun-damaged skin manifesting as Actinic Keratoses. 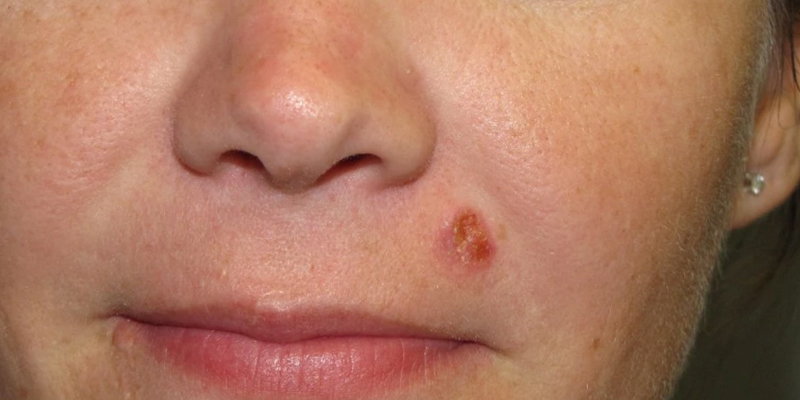 These crusty, plaque-like, scaly lesions are present for many years in multiple quantities in sun-damaged skin. Each Actinic Keratosis has the capacity to transform into squamous cell carcinoma over a period of many years. These squamous cell carcinomas arising in Actinic Keratoses are mostly easily treatable. These are not the squamous cell carcinomas that are life-threatening. Of course, exceptions exist even for this generalization. Squamous cell carcinomas that have a tendency to be much more aggressive and possibly life-threatening present de novo, not in a setting of Actinic Keratoses, and in immunocompromised individuals. SCC superficial plaques can be treated with many different modalities including excision or curettage. SCC's that present as nodules can be exophytic (growing outwardly), or can be infiltrative (growing inwardly). The exophytic tumors can be unsightly, bleeding and ulcerating, but tend to behave with less aggressive behavior than the tumors that invade deeply, spread widely, and attach to underlying structures. The infiltrative tumors should be treated promptly and aggressively. Diagnosis of squamous cell carcinoma is best made with an incisional biopsy to assess the depth of invasion and other markers of aggressive behavior. Although superficial shave biopsies can be diagnostic, a shave that is too superficial can be misdiagnosed as a precancerous (AK) or an in-situ lesion. In those cases, the pathologist will make a disclaimer that an invasive carcinoma cannot be ruled out. Squamous cell carcinoma in situ, also called Bowen’s Disease, is a non-invasive form of squamous cell carcinoma. These can transform into an invasive form over a period of years in up to 10% of cases. Histology can also define squamous cell carcinoma as having perineural invasion, a high risk finding. Angioinvasion of SCC portends a poor prognosis as well. These aggressive forms of squamous cell carcinoma can spread silently beyond the visible limits of the nodule and even the visible limits of frozen section histology of Mohs excision. Treatment of squamous cell carcinoma can be complex. The simple common lesions can be treated with Mohs excision, some with curettage and electrodessication (ED&C), and many can be easily treated with Superficial Radiotherapy (SRT). Topical Chemotherapy treatments include 5-fluorouracil creams and imiquimod creams. 5-fluorouracil cream is commonly used to treat a wide field involvement by Actinic Keratoses or early Squamous cell carcinoma. Imiquimod is an alternative to 5-fluorouracil for topical treatment of these lesions. More aggressive Squamous cell carcinoma may require wide local resection in addition to Mohs excision, sentinel lymph node biopsy, and even post operative radiation to the primary area and the regional lymphatic bed.